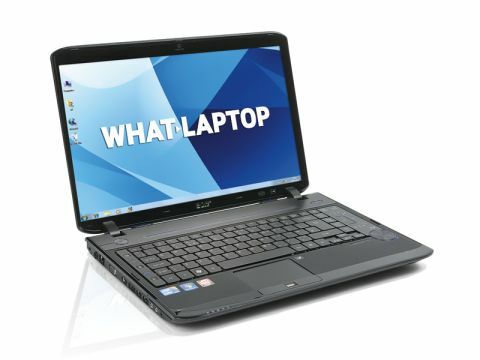 Acer is one of the world's largest laptop manufacturers and offers a truly comprehensive range of consumer machines. The Aspire 5942G-524G64Bn is its latest high-end media centre and combines a feature-packed specification with stunning performance. Powered by one of Intel's cutting-edge Core i5 processors, this is one of the most powerful laptops you can buy at this price. Designed for fast and effective multi-tasking, it made light work of our benchmark tests and effortlessly runs even the most demanding software tasks. Graphics performance is just as impressive. The dedicated ATi graphics card is designed for smooth processing of high-definition video and is fully DirectX 11-compatible, meaning gaming and media editing tasks are handled with ease. Unfortunately, the 15.6-inch screen doesn't quite match this level of quality. Encased beneath a sheet of glossy plastic that runs edge to edge, images are sharp and vibrant enough for most use. It is not a particularly bright panel, however, and lacked the impact we expected. An integrated Blu-ray disc drive adds to the multimedia potential, however, allowing you to watch the latest high-definition (HD) movies. While you cannot write data to Blu-ray discs, the drive does function as as standard dual-layer DVD and CD rewriter for creating your own discs. Often the level of power on offer here comes at the cost of poor mobility, so it's a pleasant surprise to find the Acer ran for 210 minutes on battery power. At 3.1kg, it isn't a machine for regular mobile use, but it's impressive that Acer has so effectively maximised battery life. Usability is another strong suit. The backlit keyboard has its keys raised high above the chassis and well separated, making it easy to type at speed. A touch-sensitive control panel is also fitted on the right-hand side of the keyboard for easy control of your music and movies. A stunning 640GB of hard drive storage is on offer, and a fingerprint reader is in place for adding a layer of biometric security to your most valuable files. Backing up files to external drives is also made easy by the inclusion of eSATA compatibility on one of the chassis' four USB ports, allowing stable, high-speed data transfers. An integrated webcam rounds out the features. By packing impressive power and features into a comparatively portable chassis, the Aspire 5942G-524G64Bn is a fantastic home media centre. While it is not the most affordable Blu-ray machine on the market, it is certainly one of the most powerful and very difficult to fault.